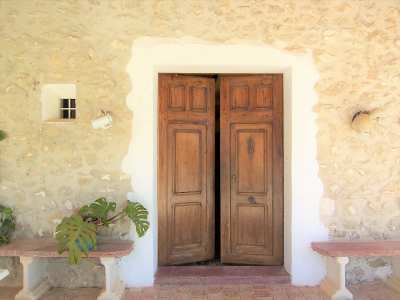 Unique finca style property in the Jalon valley, Costa Blanca. An unique opportunity to acquire a sprawling country estate on a plot of 7.029. 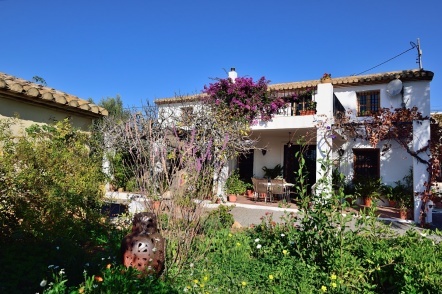 This beautiful house with guests house and separate art workshop in its own grounds, gives this stunning property endless possibilities.You will fall in love with the views ,refined elegance of this Spanish finca”. The design pays homage to the Spanish country style and combines modern living with authentic features. There are solid wood beams, windows and doors as well as original terracotta floor tiles throughout. The living spaces all have direct access to an expansive U-shaped pool terrace. This looks out over a charming, private courtyard with a mature olive tree. This provides natural shade and a lovely seating area. Furthermore there is a built in barbecue. Hallway steps lead into a charming living room, with solid wood beams and a feature fireplace. Charming kitchen and a guests toilet. From the hallway there are stairs leading to the 2 bedrooms and bathroom.Detached from the main house and completely private you have a separate, self-contained guests house. It has a real Spanish feel with direct access to the swimming pool. This outstanding property offers the complete Spanish lifestyle. It has wonderful open views of the valley and mountains. At the same time it has complete privacy. Once inside the gates it is a haven of peace and tranquillity. It comes with many extras.